Regular readers (all six of you ;-)) will have noticed that I haven’t posted about SharePoint for a while. For the last couple of months I’ve been working with the Developer Guidance team at Microsoft to write some MSDN content on enterprise-scale web deployment and application lifecycle management. I’ll let you know when the content is available, and I don’t plan to duplicate it here. What I want to do is just to draw attention to a couple of areas that I found particularly tricky to figure out. Creating web packages for web application projects in Visual Studio 2010 (for example, see ASP.NET Web Application Project Deployment Overview). The various different approaches you can use to deploy web packages (for example, see Using Web Deploy Remotely). Hosted environments, where tenants need control over specific sites but do not have server-level administrator privileges. Enterprise environments, where members of a development team may need to deploy specific sites but do not typically have server-level administrator privileges. If you want to enable non-administrator users to deploy web packages, you need to configure the Web Deploy Handler on the target IIS web server. The other deployment approaches (the remote agent and the temp agent) don’t allow users who aren’t server administrators to deploy packages. 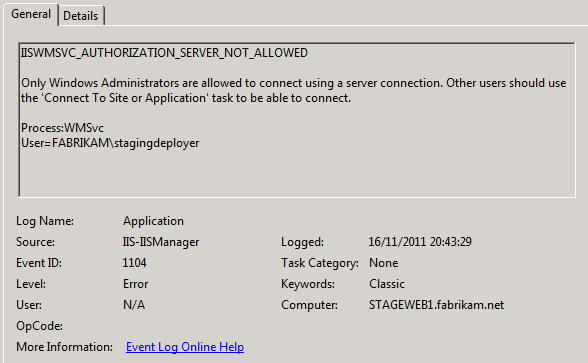 I’ll assume that you’ve configured the Web Deployment Handler to allow a non-administrator user (FABRIKAM\User) to deploy content to a specific IIS website, as described here. So you’ve got to use the site query string. Now for the gotcha. I’ve seen some fairly bizarre “workarounds” for this—for example, drop the query string and use an administrator account—this works, but it kind of defeats the object when the whole point of the exercise was to use a non-administrator user to deploy the web package. What you need to do is to use Web Deploy (MSDeploy.exe) directly rather than running the .deploy.cmd file. Run this command directly from the command line, using your non-administrator user credentials, and the deployment should succeed. Packaging and deploying web applications is a fairly broad and complex topic, and I’ve had to gloss over many of the details in this blog post. The content we’re developing for MSDN will cover these kinds of issues in much more detail, and I’ll link to the content as soon as it’s available. Thanks to Tom Dykstra at Microsoft for helping me troubleshoot the issue and pointing out the bug.